The result: the game received more than twice as many daily downloads as its iOS counterpart. That said, the Android version was free (ad supported), while the iOS version was paid. 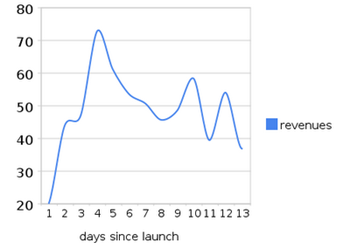 Initially, this wasn't a problem for revenue - AdSense was still in private beta, and the CPM was high enough that revenue from the free version was healthy. Or it was, until AdSense went public - by Benoit's estimate, ad revenue fell to 1/5 of what it had been during the beta. "... the Android Market app is buggy. Everyday I receive at least one support e-mail from users that have tried to install one of my apps but got it stuck on an 'installing' state. There is a solution that requires clearing the cache of the Market app which seems to fix the problem however I wonder how many people simply give up instead of sending me mail." "... I might still be disadvantaged by being Canadian. For example yesterday I received a support e-mail for someone who is usually able to purchase apps with his credit card but wasn't able to pay for my apps. The Google Checkout support site states: "The types of cards accepted through Google Checkout are based on the seller's location.". This is bad because the reduced sales numbers lower my rankings and result in even lower sales numbers." The picture gets uglier still: the Android Market doesn't deduct sales taxes, which means that come tax season he'll have to get an accountant to run all the numbers and figure how much he owes. The end result is that his revenues with the Android Market are about half what they are in the App Store, and he spends about twice as much time providing support to users. In fact, the only silver lining is that the update system is instantaneous. Nice? Sure, but it probably doesn't make up for the shortcomings. Still, at the end of the day, you can't argue with the fact that the popular movement among users and developers alike is towards Android. Even Benoit himself never once bashes the Market or praises the App Store - he simply states the facts and why he thinks things are the way they are. It's certainly an interesting read (if you're in to that sort of thing) - but hell, it looks like his whole blog is full of interesting thoughts from a developers standpoint.